From Middle English wevel, from 古期英語 wifel (“beetle”), from Proto-Germanic *wibilaz, from Proto-Indo-European *webʰel, from *webʰ-, *h₁webʰ- (“to wave, to weave”), said to be from the woven appearance of a weevil’s larval case; see also wave and weave. Compare Old Saxon goldwivel, wivel (“glowworm”); Middle Low German wevel; Old High German wibil, wipil (modern German Wiebel (“beetle; chafer”)); Lithuanian vãbalas (“beetle; weevil”); Old Norse vifill, as in tordyfill (“dung beetle, scarab”) (whence Dutch tortwevel; Icelandic tordýfill, Norwegian tordivel, 古期英語 tordwifel, Swedish tordyfvel); dialectal Russian ве́блица (véblica, “intestinal worm”). Any of several small herbivorous beetles in the superfamily Curculionoidea, many having a distinctive snout. Any of several small herbivorous beetles in the family Curculionidae belonging to the superfamily Curculionoidea. Any of several similar but more distantly related beetles such as the biscuit weevil (Stegobium paniceum). (figuratively, derogatory) A loathsome person. But you accuse other men of villainy with too easy a tongue, you weevil. I have never wanted you in this matter, and I have said so. 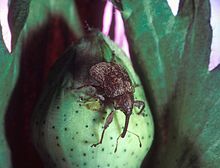 ^ “weevil, n.”, in OED Online ⁠ , Oxford: Oxford University Press, 1926. We evacuate from there quickly.